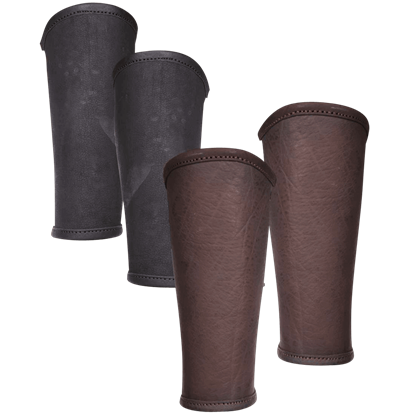 Keep your shins safe with our Albrecht Greaves. 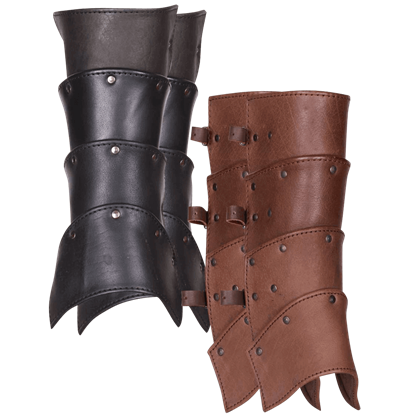 Made from leather naturally tanned for an authentic look, each medieval armour piece features four segments connected with grommets, giving this set its layered appearance. Nothing can slow a warrior down like a strike to the shins. Do not succumb to such a simple attack and allow your opponent an easy advantage. 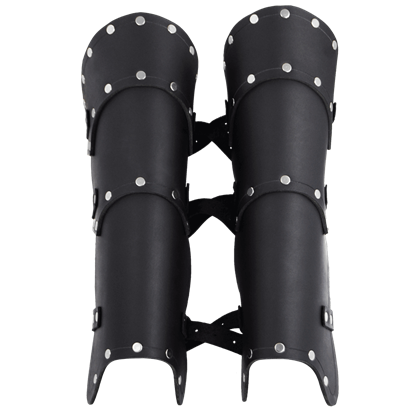 Ensure a strong stance and protect yourself with the Alistair Leather Greaves. With agility and strength, you efficiently counter an upper attack. The frustrated opponent aims for your shin, but to no avail. 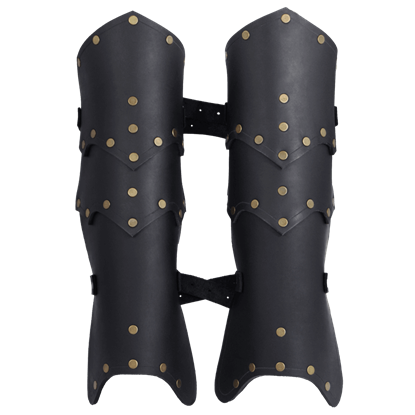 The Anvard Leather Greaves protect your lower leg, allowing you to focus on winning this battle. 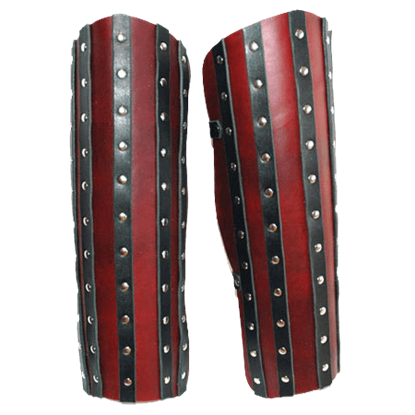 Banded Leather Greaves - 13/15 oz. Our banded greaves have a great look to them. You can get them with contrasting colors or all one. These greaves will fit men and women. Our Standard size is 17 inches from bottom of greave to top. Great for use in LARP and SCA. 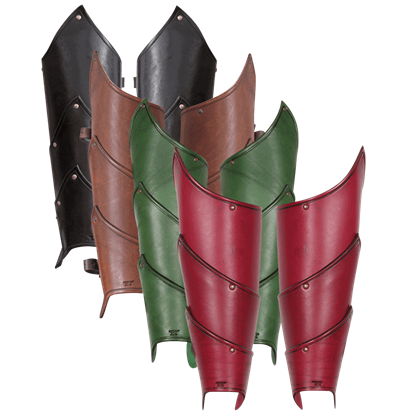 Banded Leather Greaves - 7/8 oz. Attacking an opponents legs is considered a good way to permanently disable your foe. You know this, and your opponent knows this. 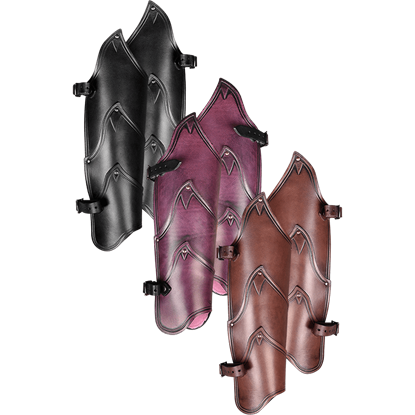 All the more reason to protect your lower legs by wearing a pair of Baudouin Leather Greaves! Stylish and efficient are two words that perfectly describe these Beaufort Greaves. 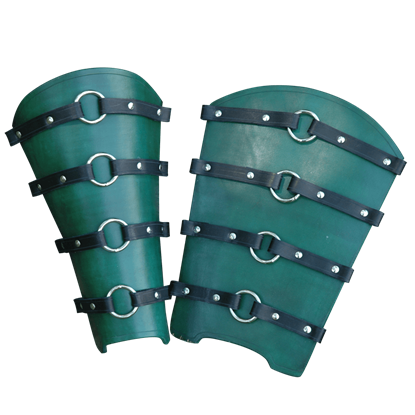 Far from just decorative, these half-greaves are handcrafted from quality materials to ensure they look fantastic and provide great protection. 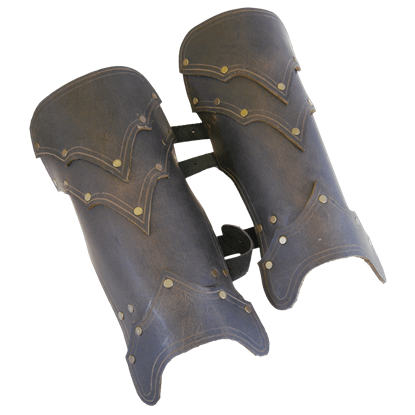 These greaves are not just a subtle detail, one that you wear for reasons of appearance alone. 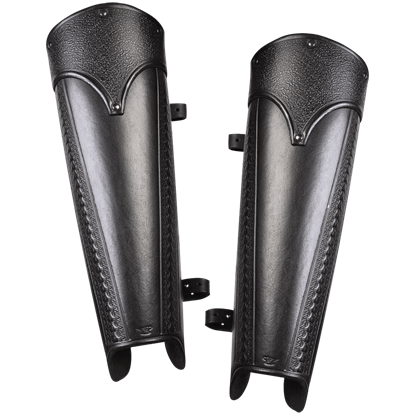 These Behan Leather Greaves are worn because they look good and offer a good level of protection to your shins, too! It might be based on Crusader era style, but there is no denying that these Bohemond Greaves look remarkably dwarvish, as well. Either way, these greaves are great to wear, thanks to their handsome appeal and protective strength. 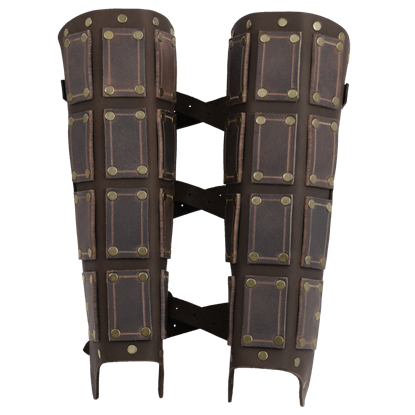 For LARP greaves of the most versatile style, check out the classic and sturdy Borg Greaves. Made out of high-quality leather, these pieces are secured to the lower leg with a sturdy cord laced through eyelets on the back.